The Canare 4E6S is excellent cable for guitar players because it attenuates the highs just enough to warm up the signal without costing you sound quality. Plenty of low end and mids. Great cable, durable jacket, braided sheild and professionally assembled. ** NOTE: Our Ultra Series Instrument Cables are now available for Quick Ship, these cables will ship within 24 hours of your order being placed!! 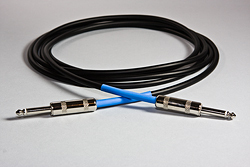 These are only available in 20ft Lengths with black cable, black shrink tube and straight plugs. We may restrict quantities due to inventory, please write us for quantites over 5 cables to assure Quick Ship.